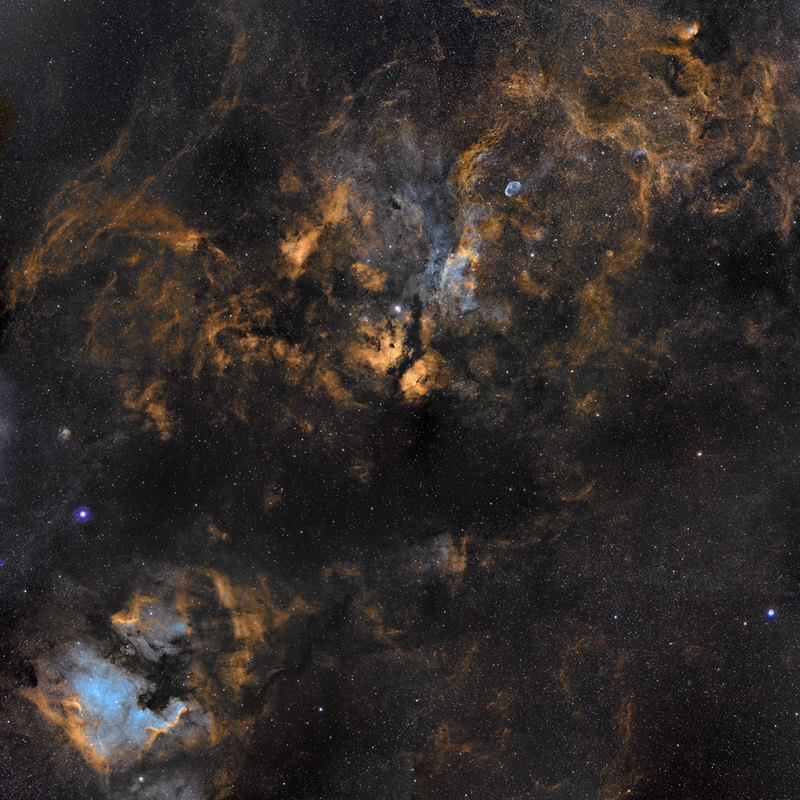 Explanation: Cosmic clouds of gas and dust drift across this magnificent mosaic covering a 12x12 degree field within the high flying constellation Cygnus. The collaborative skyscape, a combination of broad and narrow band image data presented in the Hubble palette, is anchored by bright, hot, supergiant star Deneb, below center near the left edge. Alpha star of Cygnus, Deneb, is the top of the Northern Cross asterism and is seen here next to the dark void known as the Northern Coal Sack. Below Deneb are the recognizable North America and Pelican nebulae (NGC 7000 and IC 5070). Another supergiant star, Sadr (Gamma Cygni) is near the center of the field just above the bright wings of the Butterfly Nebula. A line continuing up and right will encounter the more compact Crescent Nebula and finally the Tulip Nebula near the top of the frame. Most of these complex nebulosities are located about 2,000 light-years away. Along with the Sun, they lie in the Orion spiral arm of our Milky Way galaxy.